I want to talk about Dragon Age 2. As you may have guessed from my previous reviews; I am a Bioware fan boy and almost everything they do will win me over, and this was no exception. I absolutely loved Dragon Age 2, from its story to its gameplay, I loved the characters, the dialogue, it was absolutely amazing, however... I do understand most of the issues people have had with the game. True; the graphics aren't amazing, true; there has been a lot of customisation taken away from the player and true; the re-use of maps does seem a little cheap and tedious. Since I'm such a fan boy we'll get the positives out of the way first so I can pretend there are negatives in more detail. The story was great; it was based around Hawke, the protagonist. He or she starts out as a refugee, recently forced from his home in Lothering (you might remember Lothering as the first place you went after you escaped Ostagar) with his mother and brother and sister. You decide to go to Kirkwall, where your mother has family. From arriving in Kirkwall to the end of the game the player is constantly trying to move up in the world, from refugee to lord all the way up to Champion of Kirkwall. The story doesn't have one over arcing villain or any impending doom that directs you, however the player is told at the beginning that something happened. Throughout the story there is a general undercurrent that the Templars and the Mages are at war, secretly and that is generally what the story is about. However even if I did love the story, without the intensity of a master villain to slay the story does seem unfocussed and lacks drive until the final act. From the outset the player is told that the champion was there when this major event happened, and that he is the only one that can put the world back together, you're also told that he vanished, but you're told this by one of your party members. There’s something about giving the story narration from one of your main characters that takes away from the risky choices, at least when it comes to that characters general survival. My major problem with the games narrative, regardless of my love for it, was (without giving too much away) in the end it felt like a massive introduction to the next game. most games where it starts as a story to learn something at some point you learn it and then you are able to do what needs to be done, with Dragon Age 2 the character doing the interrogation does not find the information they seek, they simply know that the Champion, just like the Warden disappeared and the world is falling apart. I also loved the characters from DAO popping in every now and then, Zevran, Leliana, Alastair... would have liked to see Sten or Shale, but I loved the other guys’ appearances none-the-less. Gameplay wise I thought that the quick paced action of this game worked a lot better than with the previous iteration. It kept the player on their toes with the need for constant control of your character and your whole party. So far I've only played through as a Mage, but I played the demo as both the Rogue and the Warrior and all classes are incredibly fun to play. All of the abilities are more showy and, in some cases, far more useful. The only thing I can fault is, and this is purely personal preference, the inability to target team mates for spells. In DAO I would often let my Alastair get all the enemies crowded around him and then cast blizzard of lightning storm on him, in DA2 I was forced to target the floor or an enemy. It's only a minor thing, but then I did also really, really enjoy the game. The Missions were well put together, and while many people complained that the game re-used a lot of maps to me that made sense. Your in a city, one city, working your way up, you're likely to visit places more than once, when a place has been swept of enemies you're not likely to come back three years later and find it still empty or with the enemies bones resting on the floor. Still, it was a big city; more locations would have been nice. Maybe some different shaped estates. I don't know, you'd have to poke a Bioware level designer to see what went wrong there. My main grievance with the game was that they took a lot of customisability out of the user’s hands. 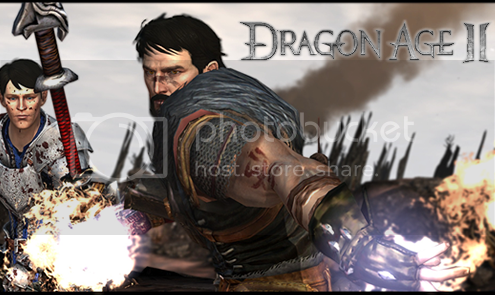 In DAO my character was a mage, but he was a mage with sword, shield and armoured up to the chin. I understand that the lack of powerful armour could be chalked up to there not being anyone to teach the Champion Arcane Warrior to transfer Str/con stats to Mag/Wis stats, but then I didn't even get the choice to give the sword and shield character a great sword, even though she had the stats. The archer couldn't wield daggers, it annoyed me. I like to dictate what my characters can do, I don't like it when that choice is taken away from me. That said, of course looking at it from a narrative point of view I agree with it, a person trained with a sword and shield would lose a lot of skill when faced with using a great sword, just as an archers skills are not in tuned to using twin daggers. Still, on a petty note, I wanted my mage to wield a sword. Over all I loved this game, but there were some major flaws, too few locations, the removal of customisation, the lack of drive to the story and the feeling at the end that I just paid £29.99 for a massive advert for the next game. I'd give it a biased 9/10 and an un-biased 8/10.